Sherry A. Rogers, M.D. - The Cure Is In The Kitchen by Sherry Rogers, M.D. Home / Books / By Author / Sherry A. Rogers, M.D. 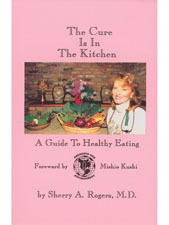 / The Cure Is In The Kitchen by Sherry Rogers, M.D. Enlarge Image Email to a Friend The Cure Is In The Kitchen by Sherry Rogers, M.D. Product Description: The macrobiotic way of life is based on living in harmony with the natural environment. The environment has a profound influence on our health. The quality of air that we breathe and water we drink directly influence our condition, as does the human environment around us. A noisy, high-stress environment, for example, can interfere with our efforts to be healthy, while a quiet, natural environment supports well being. Daily food is a condensed form of the environment that we internalize each day, and thus has a decisive influence on health and well being. Between this book, Tired or Toxic?, You Are What You Ate, and The E.I. Syndrome, Dr. Sherry Rogers explored the relationship between diet, environment, and human health and sickness. She explains how an unnatural, overly artificial diet contributes to a variety of health problems, and how certain aspects of the modern lifestyle, including the use of artificial substances in our surroundings, can also weaken health. It was through her study of environmental illness that Dr. Rogers discovered the macrobiotic approach. She has since deepened her understanding by participating in special seminars for physicians presented by the Kushi Institute, and by attending and assisting at the Macrobiotic Way of Life Seminars in Boston. She has also begun to offer macrobiotics to an increasing number of patients, and has witnessed numerous improvements in health as a result. With her study and personal experience as a background, Dr. Rogers explains in her books how the macrobiotic diet, based on unrefined whole grains, beans and bean products, fresh local vegetables, sea vegetables and other whole natural foods, can prevent illness and restore health. She offers the case histories of her patients as proof of the efficacy of macrobiotics. Dr. Rogers also includes practical guidelines and suggestions designed to help readers embark on a new way of eating and living. Dr. Rogers is a pioneer in the development of a new approach to healthcare, based on the synthesis of traditional and modern approaches. By emphasizing diet and way of life, she is pointing the direction toward and understanding of the most fundamental causes of sickness. And by presenting the macrobiotic diet within the context of prevention and recovery, she is furthering the development of a comprehensive system of healthcare that can solve society's most fundamental problems. Like Dr. Rogers, hundreds of physicians throughout the world are pursuing the macrobiotic way of life, both in their own lives and as a solution to the modern health crisis. Macrobiotic study programs and seminars for doctors have been presented in the United States, France, in the Central African Republic of the Congo, and in Hungary and Yugoslavia. Dr. Rogers is a leading member of the international network of macrobiotic physicians, and her efforts are supported by colleagues around the world. It is my hope that these ongoing efforts, including the publication of this book, will serve for the development of a medicine of humanity that will contribute to the health and peace throughout the world. About the Author: Sherry A. Rogers, M.D. is a Diplomat of the American Board of Family Practice, a Fellow of the American College of Allergy and Immunology and a Fellow and former Director of the American Academy of Environmental Medicine. She is a lecturer of yearly original scientific material, as well as advanced courses for physicians. She was the keynote speaker for the International Symposium Indoor Air Quality '86 in which she has described the office method for testing chemical sensitivities. She developed the Formaldehyde Spot Test and published her mold research in three volumes of the Annals of Allergy, and chemical testing methods in the National Institute of Health's journal "Environmental Health Perspectives." She has lectured throughout China and the United States as well as Sweden. England, Canada, and Australia. She has appeared on numerous television and radio programs and writes monthly articles for health magazines and newsletters covering all aspects of environmental medicine. Wellness Against All Odds by Sherry Rogers, M.D.